Yesterday afternoon the garbage bins were almost full, the atmosphere was right, the roast was in the oven and wouldn’t be ready for a good hour, so Muddy Hubby and I loaded the kids in the ute, chucked the garbage bins on the back and took the kids to the local tip. Now it may not seem like such an exciting thing, but a trip to the tip on a Sunday afternoon can also mean a detour via the local pub on the way home. 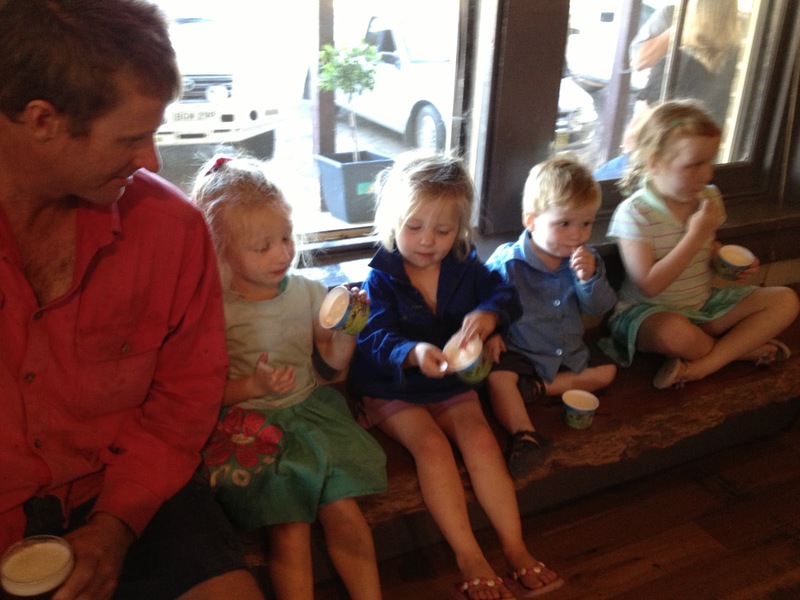 The Muddy Kids had their choice of an ice cream or a packet of chips to share, the ice cream won hands down. So we perched them up all in a row and while Muddy Hubby and I enjoyed a quiet bevvy and a chat with some locals the kids devoured their ice creams. It was just us as a family hanging out, just damn lovely really. The joys of living where we live, where a trip to the tip is a highlight. Somehow I think in 10-15 years time they’ll still be perched up at the local pub all in a row, just not with ice creams. This entry was posted in Family, Farm on March 17, 2013 by nat. So sweet! Look how big Muddy Baby is getting!! What a great way to spend Sunday afternoon!